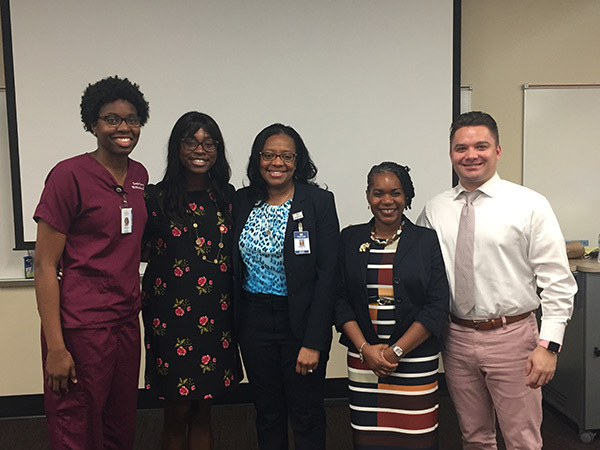 Samford University McWhorter School of Pharmacy alumna Vanessa Gray, ’91, recently returned to her alma mater to speak to student members of Samford’s Student National Pharmaceutical Association (SNPhA) chapter in honor of Black History Month. Gray was a member of the school’s first Doctor of Pharmacy cohort, becoming the first African American woman to earn a Pharm.D. at Samford. Recently, Samford honored her as one of the inaugural recipients of the Audrey Gaston Howard award. While she has served in many roles throughout her career, including time as a Samford faculty member, Gray is now the director of pharmacy services at Grandview Medical Center in Birmingham. In her words to students, she challenged them to not accept mediocrity, instead, daring them to be great. Gray challenged students to figure out what they are passionate about because “when your passion meets purpose, aspiring to become great is easy. When passion meets purpose, your everyday work will not feel like work,” she said. Gray shared stories from her childhood, high school and eventually her time at Samford. “I had a great experience here at Samford. Yes, at the time, I was in the minority, but I had mentors who didn’t look like me but saw something in me and took me under their wing… and all of you have that inside of you,” she said. At the end, students had the opportunity to ask questions, and many were interested in her role as director of pharmacy services at Grandview, which opened in 2015.